This low profile desktop UHF RFID reader is designed to read and write to EPC Class 1 Generation 2 (ISO 18000-6C) UHF RFID transponders. It is powered by (and communicates via) a standard USB connection, providing a convenient device that can be hosted by any PC. 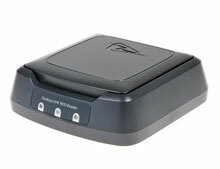 Desktop UHF RFID Reader (FCC). Reads and Writes Class 1 GEN 2 UHF. Desktop UHF RFID Reader (ETSI). Reads and Writes Class 1 GEN 2 UHF.